After watching numerous British beauty bloggers and vloggers rave about Charlotte Tilbury, I could not be more excited for the brand's recent launch here in Canada (exclusively at Holt Renfrew). A world-famous makeup artist with over 20 years of experience in the industry, Charlotte Tilbury's makeup line offers us beauty addicts a range of innovative products with amazing pigmentation and great packaging. I seriously want everything. At the heart of the makeup collection are 10 signature looks, and I was lucky enough to be sent The Glamour Muse set to play with. Inspired by the 1970s disco era and icons like Jerry Hall and Diane Von Furstenburg, this look is super glam with a wearable daytime look that can be amped up for a night on the town. This look is obviously named after the Luxury Palette in Glamour Muse, a colour-coded eyeshadow palette that contains 4 shades. The lightest shade is intended to "Prime", the second lightest shade is to "Enhance", the deep purple is the "Pop" and the taupe is used to "Smoke." These shadows are really nicely pigmented and apply like a dream. In addition to the palette, Charlotte has curated a number of other products from her line to go with it. These include the Rock 'N' Kohl Iconic Liquid Eyeliner Pencil in Barbarella Brown, Full Fat Lashes Mascara in Glossy Black, and the Cheek to Chic Swish & Pop Blusher in Love Glow. For daytime, The Glamour Muse uses only 3 of the eyeshadows from the palette (the purple is saved for adding the "Pop" obviously). It's fairly neutral, right up my alley in terms of everyday makeup, and I would absolutely wear this to work. I especially love the Lip Cheat Re-Shape & Re-Size Lip Liner in Pillow Talk, which is a great MLBB colour, topped with Lip Lustre Lip Lacquer in Candy Darling. This gloss somehow manages to be super shiny but not sticky at all. For night, only a few small additions are necessary. Using my fingers, as per Charlotte's instructions, I added a wash of the purple shadow all over my lids. Next time, however, I think I will use a brush and pack it on since I really hate using fingers to apply eyeshadow. I then added some more liner and an extra coat of the Full Fat Lashes, before finishing off with the K.I.S.S.I.N.G. Fallen From The Lipstick Tree in Velvet Underground. Ordinarily, I don't wear deep fuschia pinks like this but I find I always get compliments when I do (examples here and here)... so maybe this is something I need to wear more often? 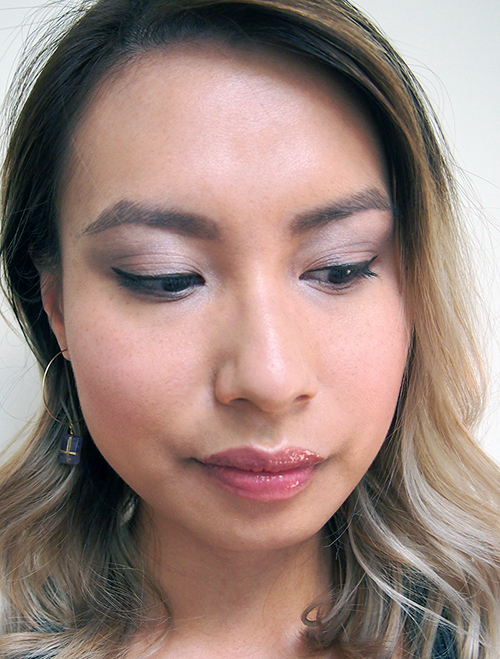 If you want to get this look yourself (or any of the 9 others), Charlotte has helpfully filmed a series of Youtube tutorials showing you exactly what to do. I followed along to create the FOTDs in this post and found her instructions incredibly easy to understand. 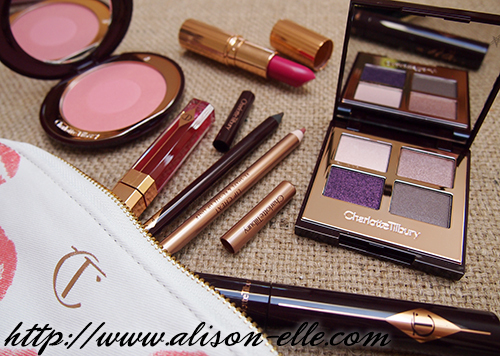 Charlotte Tilbury can be found in Canada exclusively at Holt Renfrew in Toronto and Vancouver or online. yes! you should totally wear fuchsia more :) it really suits you! I've heard of this brand, but I have yet to try their products. They have the cutest packaging! Beautiful! Love the plum eye shadow! So pretty! 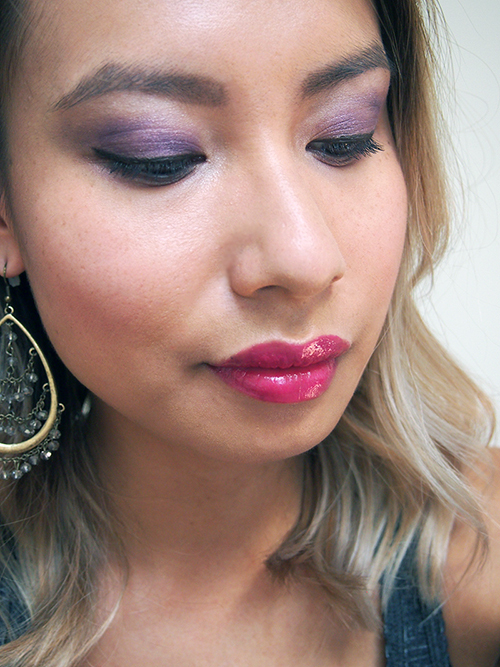 I love the bold purple in the nighttime look. You did a fabulous job! Such a great day to night look! 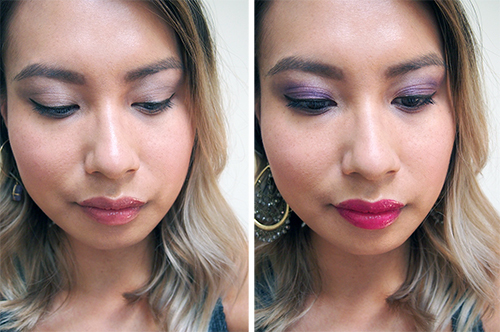 i love the pop of color on your lips :) Would love it if you would stop by my latest post! Such a very stunning look! !